Autodesk Nastran In-CAD offers a wide-range of simulation spanning across multiple analysis types. It is a part of Autodesk’s Product Design and Manufacturing collection – delivering a high-end simulation in a CAD-embedded workflow so engineers and analysts can make great products. 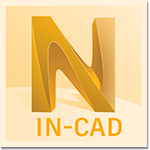 NOTE: The Nastran product name has changed for the 2020 release to Autodesk Inventor Nastran. This new version can be downloaded here.